SunVenture Cruises answers some of the most frequently asked questions about our Okaloosa Island and Destin cruises. We are here to help you with any questions you may have, in order to help make your cruise experience as memorable as can be. Our experienced team of local experts are readily available to answer your questions or help you customize a private cruise. We have two convenient locations just five miles apart. If you can’t find availability at one location, make sure to check the schedule for the other location. While we allow 30 minutes for boarding, please allow enough time for parking and traffic especially in the busy peak summer season. It is suggested to make a reservation online for your cruise. Select your location, cruise date and time from the online reservation system. Remember that if there is no availability at one location, you can check the other location that is only five miles away. Then enter the number of people in your party, enter any promo codes and confirm your total. Enter your contact and payment information on our secure online system. Once the transaction is complete, print your boarding pass or the email confirmation that is sent to you to present to at the SunVenture kiosk. How far in advance should I arrive for my cruise? You must check-in 30 minutes prior to the scheduled cruise time at the SunVenture Kiosk. Please allow enough time for parking and traffic. Please have your email confirmation available on your smartphone or have a printed copy of your boarding pass. There is a 48 hour cancellation policy. If for any reason you are not able to cruise with us, you must call our office by 5 p.m. central time 2 days prior to your cruise date. 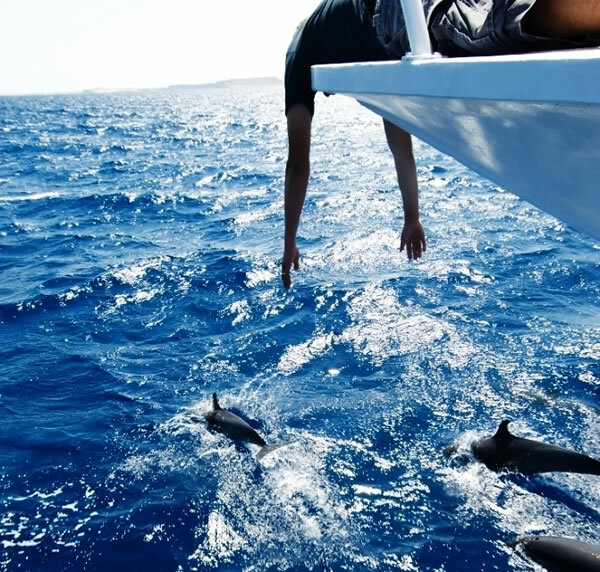 Our two catamarans altogether can accommodate up to 98 people for any private cruise. 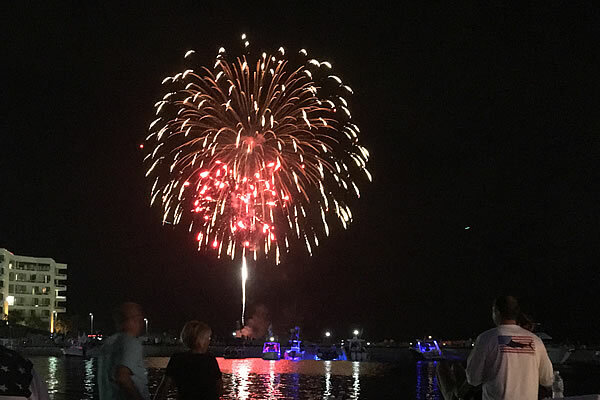 We can customize any private cruise experience including Crab Island cruises, Destin Sunset Cruises, Destin Harbor Dolphin Tours, Destin Harbor Fireworks Cruises and more. Our event planners can assist with all the details, including catered food. If you are seeking a venue for a larger group for Destin Florida weddings, rehearsal dinners, corporate events, yacht rentals or other private charters in Destin, consider our sister yacht – the 125′ SOLARIS entertainment and dining yacht (voted “Best Wedding Venue” by the Knot readers for the past nine years) hosting up to 150 guests. SunVenture Cruises takes daily cruises to Crab Island on both catamarans from Destin and Okaloosa Island. Our captain and boat stays with you the entire time, giving you complete access to your coolers, a restroom, shaded areas and helpful deckhands. Learn more about our Crab Island Cruises here. What types of private cruises & Destin boat rentals are available? SunVenture Cruises offers two catamarans that are a unique and fun option for private parties & cruises and pontoon boat rentals for up to 98 guests. Your guests will not only enjoy the state-of-the-art sound system, but also the open deck, ideal for relaxing in the sun or dancing under the stars. You also have access to our full-time Destin event planners who are experienced and creative in helping you with all the details. Complete a request for reservation form for pricing and availability for private cruises or give us a call at the location of your choice. Flexible schedules & catering available. What if the weather looks like rain? The captain will make the call at the time of the cruise. If the cruise is cancelled, it can be rescheduled or the reservation can be cancelled. How many people must I have in my party for a private cruise or boat rental? Big or small, we cater to all. There is no minimum number of people needed for a SunVenture private cruise or boat rental. Private cruises & boat rentals are based on availability for up to 98 people. Call the location of your choice or complete a request for reservation form for pricing and availability private cruises. Yes, there is a bathroom on board and our boat / captain stays with you the entire time. Will we get wet on the cruise? You will be on a boat so there is a chance you may get wet. Plan accordingly. We do not take responsibility for any lost, stolen or damaged items brought on board. For all our cruises, you should plan to bring a towel, sunglasses, cash to purchase drinks/food, clothes you don’t mind getting wet or a bathing suit and sunscreen and flip flops, sandals or aqua socks. Other suggested items include a snorkel/mask and a water proof camera. Personal carry-on bags are allowed as long as they fit and are stored under your seat. Coolers are NOT allowed on the dolphin / sunset cruise but are permitted on the Crab Island cruise. Hats and other items may be blown away and are not recommended on board. No loose clothing or loose items please. All your personal items need to be secured and stored under seat. Are beverages and food available for purchase? Yes, drinks and snacks are available for purchase (cash only). Personal coolers and alcoholic drinks may only be brought on board for the Crab Island cruises. Crab Island cruise patrons must drink responsibly or authorities will be called. Under age drinking is strictly prohibited. While coolers are not allowed for the Sunset Dolphin Cruise, drinks and snacks are available for purchase (cash only). All children under the age of 18 must be accompanied by an adult. 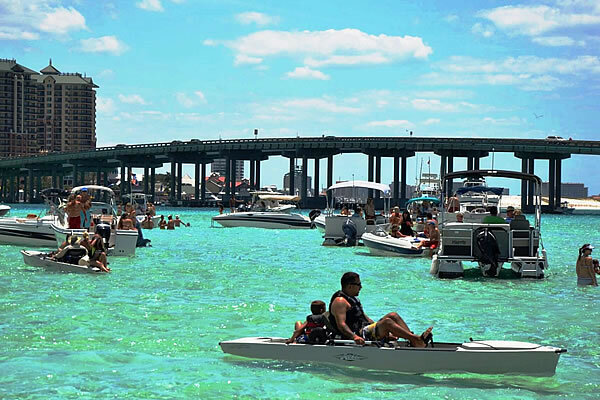 For the Crab Island cruises, all minors must be accompanied at all times by their parent or guardian in and out of the water. Great Dolphin Cruise and Crab Island Excursion - This was our first beach vacation to Destin and Sunventure was recommended to us. We had such great time on the Sunset Dolphin Cruise. We spotted dolphins as soon as we got out the Destin harbor into open waters and they were so close to the boat I was able to get great pics and video. Then we came back for a tour of the harbor and docked near the barge that shot off fireworks so we were right under them. We came back 2 days later for the Crab Island excursion. It was a great alternative to renting our own boat since we weren’t comfortable enough to captain one ourselves. Crab island is gorgeous and the boat was nearby if we ever needed something from our cooler. We actually never went back to the boat until it was time to leave because we got our lunch and all our drinks from the super friendly venders on Crab Island. The captain and first mate were very helpful and knowledgeable and it was cool that the captain was a fellow Virgin Islander like myself." We’re happy to answer any questions about our private cruises.